Saturday, March 11, 3 p.m.—RANDOLPH—Chandler Music Hall brings Vishtén to the Main stage Saturday, March 11. The concert, starting at 7:30 p.m., will be an evening of driving rhythms and east-coast French-Acadian swing of the traditional music from Prince Edward Island (PEI) and the Magdalen Islands. A workshop is offered at 3 p.m. for musicians interested in learning Acadian tunes. 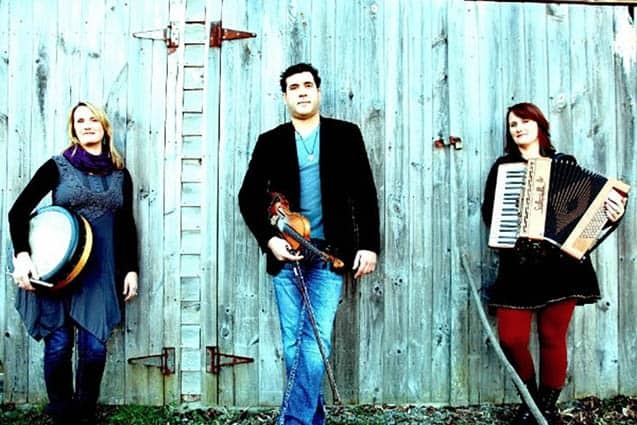 For over a decade, Vishtén (Pastelle and Emmanuelle LeBlanc and Pascal Miousse) has been crafting its own brand of new traditional music and creating a trademark sound that combines traditional French-Acadian songs and tunes and energetic rhythms with original compositions. All highly accomplished multi-instrumentalists and singers, Vishtén’s unique blend of fiddle, guitar, accordion, harmonium, whistles, piano, bodhrán, jaw harp, Moog, electric guitar, and percussive dance make for an exciting tour de force weaving together old-world and contemporary sounds. In the workshop preceding the concert, participants will learn a repertoire of Acadian tunes from PEI and the Magdalen Islands. The workshop is intermediate-advanced level, all instruments welcome. RSVP to outreach@chandler-arts.org or 802-431-0204. Chandler Music Hall is located at 71-73 Main St., Randolph. Visit chandler-arts.org for information and tickets.